Hi to all. New Rigol DS1054Z owner. Below is an FFT example. My Kenwood TS-2000 transceiver was transmitting on a carrier frequency of 7.2 MHz. 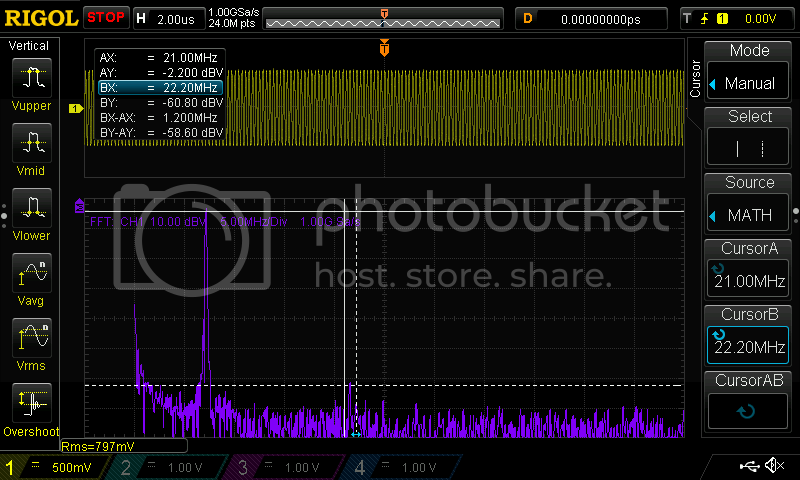 Between the two vertical cursors is the third harmonic spur at 21.6 MHz. It is -58.6 dbV down from the carrier. Liking this scope. Guys sorry for bringing this up again. This scope is in my future budget. Anyone tried it with audio signals? I am looking into testing the fidelity of small audio amplifiers. Has anyone tried to swap out (presumably (one or more of the) ADC(s)?) to get a higher sample rate to increase the resolution (VWB?) The bottleneck is in the ADC sampling rate so one channel with a better ADC should get you a bit of performance boost. Send in a sawtooth to sweep and you should be golden? If FFT is your main thing then maybe the R&S1002 is a better fit. It has a better FFT than the DS1054Z and it's a lot cheaper than the MSO3000s. It's also small, silent, and cute. The HMO1002 also has an 8bit DAC, which is insufficient for audio use. As other have commented, use a sound card together with one of the many audio software packages available for free. Although not cheap at all, Metric Halo sells excellent 24 bit audio interfaces and a measurement program called SpectraFoo that, among other goodies, does excellent spectrum analysis. Well, it depends. This scope is not well suited for measuring audio, indeed, e.g no logarithmic freq scale, but for developing, the 100 dB S/N with HiRes is a way better than you get usually from 8 bit scopes. Most of them nowadays can sample at 192 KHz as well, and the frequency response should reach 80 KHz. A friend who was working on some ultrasound stuff actually used a not expensive audio interface (around 100 euro, maybe) sampling at 96 KHz and it produced perfectly valid 30 Khz signals. Indeed, I can fully confirm @_Wim_ that nowadays nearly all reasonably good audio-interfaces will work more than satisfying for audio measurements. With 192 KHz samplerate, today you should go flat from at least 10 Hz to 95 KHz. I use the (professional) analysis-software "hpw-works" [http://hpw-works.com/] together with several RME-Intefaces. RME is generally known to deliver a superior quality (and not to be the cheapest manufacturer). With equipment like this you can really make absolutely reliable and professional measurements and trustworthy tests of your audio equipment.